Very warm bag, comfortable down to -20°F for women I'd say. Note that it is heavier than a down bag and doesn't compress down very small. 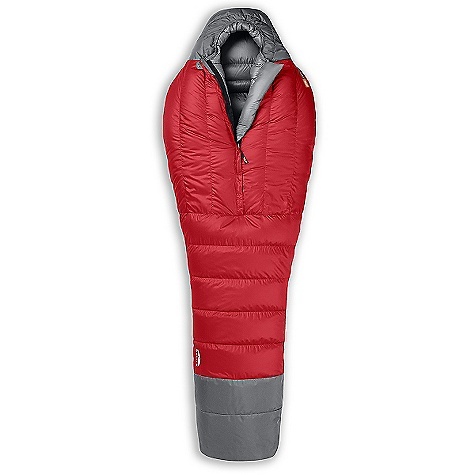 Having used this sleeping bag in a cold cabin when outside temperatures were about -25°F, I feel this bag keeps one comfortably warm down to -20°F (women), although the technical rating is for -30° (survival temp). This bag has a storage pocket on the upper body (outside of bag). It would fit a flip phone of yesteryear but not my Galaxy s4. I use it for chapstick at night but hate having to get my hands cold to use the pocket since it is on the outside of the bag. Insulated draft tube extends to bottom of bag and does effectively minimize heat loss in the zipper area. Face gasket and draft collar seal both individually keep in lots of heat during my testing of the bag at room temperatures (~75°F room) but in real life cold places, I'm surprised that I'm too cold/tired to properly adjust both and my sleeping bag liner to most efficiently trap heat. Doesn't compress down very small. I don't use the stuff sack it came with because it feels too hard to stuff it in. I just stuff into a 30L Sea to Summit eVent Compression Dry Sack which works beautifully. The straps of this compression sack make it easy to compress the sleeping bag (tough task as it isn't super 'springy'). The weight is heavy compared to down sleeping bags in the -20° to -30° temperature range, but the price for a synthetic bag is pretty nice. Test 2: I originally bought this sleeping bag because I was going cabin camping (moderately insulated cabin heated with a wood stove) when it was -25°F outside. I was wearing fleece pants over Patagonia Capilene 4 pants; top was a fleece top over spandex-y shirt with a thin fleece layer on the inside. Hot water Nalgene bottle at feet, hot hands feet pads on both feet, two pairs of wool socks on. Cabin never warmed up enough to melt the snow I tracked in next to my bunk. I was still very cold inside my liner and sleeping bag. Enough to sleep, but my body woke me every hour to warm up my gloved hands. A poor sleeping pad may be a huge part of the chill since others on the trip were fine in -20° rated bags on top of regular foam pads. Test 3: Used this winter camping on a glacier. We pitched [very nice expensive winter] tents on snow at the foot of the glacier. Temperature at night was 25°F (day 30°F). I used a Downmat 7 UL on top of a Therm-a-Rest RidgeRest SOlite sleeping pad. Slept in this sleeping bag and sea-to-summit fleece toaster liner. Had on two fleece tops and two fleece bottoms. Hot water Nalgene at my feet and two pairs of wool socks. Was way too warm in the middle of the night from above and below! The bag, tent, and downmat were all significant factors in this I believe. Tent: 3 of us played cards in the closed up tent for about 20 minutes and my infrared thermometer indicated the temperatures rose from 28°F to 37°F. I've wanted to get into winter camping for some time now, but I've always been cold when trying to sleep. So I got the warmest bag I could get my hands on. This bag has been really great. 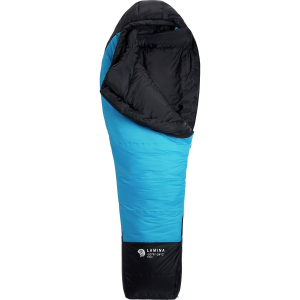 The night I tested it, it reached -20 outside and I slept on a tarp directly on snow with no pad to help insulate. I ended up stripping down to just a t-shirt and sweat pants.... Was totally cozy and warm. The bag is plenty roomy too! (I purchased the long version). I'm 6'4" and 260lbs and I had enough room to put my boots in a bag and put at the bottom of the sleeping bag.